Usually when I get a craving for chocolate and peanut butter, I make something with it, stuff my face, and the craving subsides. However last week’s cookies didn’t seem to subdue my cravings, as they carried into this weekend. I was wondering what I should make, and I kept trying to think of how I wanted to marry these two amazing flavors. I was perusing one of my favorite baking blogs, Sprinkle Bakes, when I found this recipe for her peanut butter cup brownie cake: three dense chocolate brownie layers separated by creamy peanut butter. I couldn’t resist. I had to make it. And boy was this a monster! 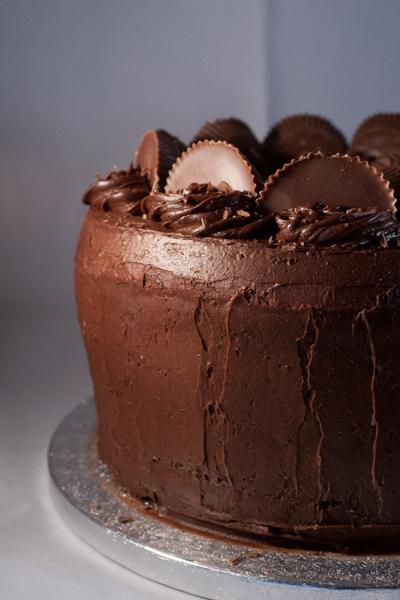 This cake was so tall that the Reese’s cups on top were scraping the top of my cake carrier, easily crowning it as the tallest cake I’ve made to date. But it was delicious and it totally cured my craving. Sprinkle Bakes recommends very thin slices (25 slices per 9-inch cake), and that was seriously correct. In fact, the richness of this cake lended itself to making it one of the few of my bakes to last two days in our office – and that’s quite an achievement. 1. First make the peanut butter layers. In the bowl of your mixer, blend together the icing sugar, peanut butter and melted butter until it forms a crumbly mixture. Add the cream 1 Tablespoon at a time until it forms a thickened dough that you can work with (like sugar cookie dough). It should hold together if you squeeze it into a ball. Line two 9-inch cake tins with parchment and butter the pan. Then divide the dough evenly between the two pans, and press it firmly into each tin to form the peanut butter layers. 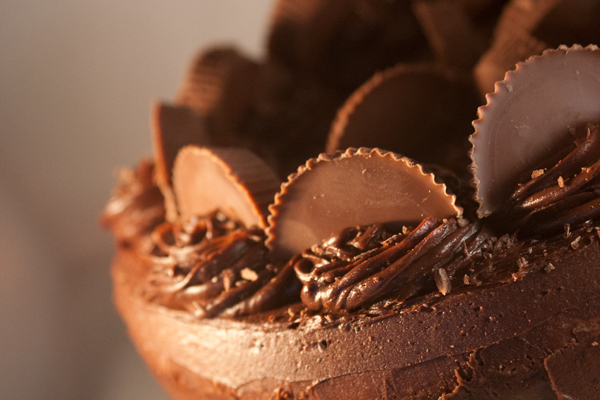 Place them in the freezer to set while you make the brownie layers. 2. Next, make the brownie layers. preheat your oven to 350°F (175°C). Grease 3 9-inch cake tins, line with parchment, and flour each pan. 3. In a large saucepan over medium-low heat, melt the butter and chocolate, stirring until smooth. Once everything is melted, remove the pan from the heat and whisk in the sugar, followed by the eggs. Stir in the flour, salt, and baking soda. 4. Divide the dough between the three prepared cake tins and bake for about 25 minutes until they’re done. Allow them to cool in the pan for 10 minutes before turning out to cool on a wire rack completely. 5. Once everything is cool, prepare your frosting. In the bowl of your mixer, beat the butter and icing sugar together. Switch the attachment to the whisk, scrape down the sides of the bowl, and beat again until light and creamy. Next, add in the cocoa powder, vanilla, and coffee. Mix on high until everything is incorporated and the mixture is light and airy. 6. Now you’re ready to assemble. Place your first brownie layer on the base and coat with a very thin layer of your frosting. Next, turn out one of your peanut butter layers and place in on top of the brownie layer. Coat the peanut butter layer with a small amount of coffee, then repeat. 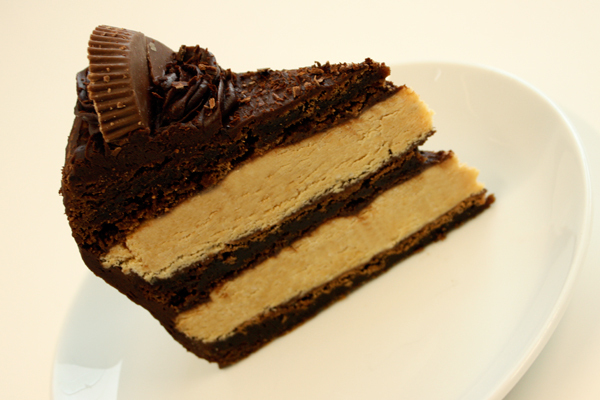 Your layers should be: brownie, peanut butter, brownie, peanut butter, brownie. 7. Once all of your layers are assembled, coat the top and sides with another thin layer of frosting, Place the rest of your icing into a piping bag and use it to pipe 11 rosettes around the top rim of the cake, and 4 more in the middle. Place each Reese’s cup half into each rosette. To finish it all off, sprinkle some chocolate shavings over the top of the entire cake.